African football legend Samuel Eto’o has joined the Qatar 2022 Supreme Committee for Delivery & Legacy (SC) as a Global Ambassador. Eto’o is currently still playing for the Qatar Sports Club in the QNB Stars League. His career saw him win 118 caps for Cameroon scoring 56 goals – he played in four World Cups. Playing his club career predominantly in Europe, he won the Champions League twice with Barcelona and once with Inter Milan. “Football goes much farther than politics and it’s important that football travels the world because it’s everywhere – it’s an incredible social force. 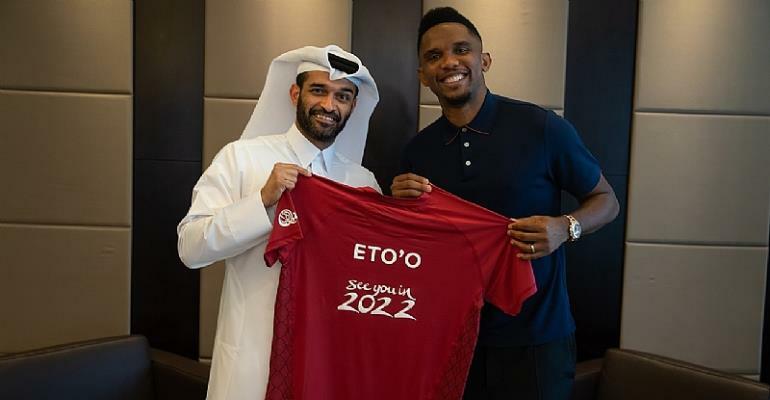 It has an impact on our lives even if some do not like football – we are always paying attention to football and I am happy that Qatar is and will be the face of it for a month during the World Cup, and Qatar will also be the face of the Middle East,” said Eto’o. Eto will have “a particular focus on workers’ welfare projects,” said an SC press release. Al Thawadi again emphasised the positive social impact that the 2022 World Cup can have “across the Arab world and beyond, for generations to come.” That programme is now gathering pace. “I am confident that working alongside someone of Samuel’s calibre, stature and character can only positively help us to achieve these goals together,” said Al Thawadi. Eto’o joins Xavi Hernandez and Mohammed Saadon Al Kuwari as official SC Ambassadors.